We are in a time where the odds are in our favor, everything we could possibly want is at our fingertips. The possibilities are endless. Do you want to have a full book? You don’t have to go door to door passing out business cards anymore, instead we post on social media. 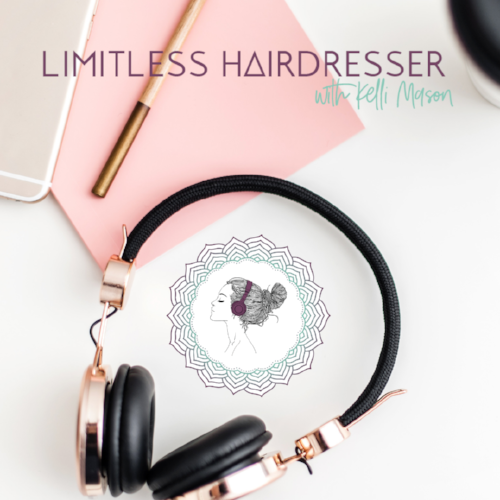 Do you want to open a salon...and actually make money doing it? There are several educators out there sharing what has made them successful. Do you want another outlet to express yourself and have passive income beyond your BTC gig? You can start a blog, youtube channel, or podcast. Many of us don’t know where to start! You can probably google it...or shoot a DM to someone who is doing it already, I’m sure they will share a tip. All these things and still we place limitations on ourselves. We don’t believe we can. We don’t believe we are worthy. We don’t give ourselves the chance to fly. Conditioning. We have been been staring at a screen for years now infesting our minds with garbage. Scroll, scroll, scroll, double tap, like, compare, compare, compare, repeat. We are leaving trails of self doubt and insecurities all throughout our subconscious. It’s no wonder we struggle with believing that we are capable of anything beyond where we are. Stuck. Feeling like an outsider. Feeling like we aren’t good enough. Couple all of that with a stigma of “who we are” passed down through the times. With the exception of the upper echelon of elite trailblazers. The average hairdresser from middle america has had to claw our way to being respected. Our parents would say...go to college first, hairdressers don’t make enough money, etc, etc, etc. Now. Who should be accountable to change all of this? Us. We have to. It’s time to rise above the labels. It’s time to take our power back and own who we truly can BE. It all starts within us. Reprogramming our minds to be confident, strong, giving, loving, worthy human beings...who happen to express ourselves through art, change people’s lives, and make an amazing living healing and having fun. We deserve it, but it’s going to take some work and we have to be willing to do the work. We have to expand our minds and gain new perspective. You might be wondering why I have the cred to be able to help lead this movement? Fair, fair. Let me tell you a little about me. I’m a hairdresser who has been through 31 years of life. Struggles, successes, more struggles. Depression, anxiety, fear, doubt, comparison, unworthiness. I’ve had it all too, and each day trust me, I face it. But something changed in me, a really beautiful gift…I became aware. I started to realize my patterns, and I didn’t like them. I didn’t like how I felt sitting in all that low vibe nonsense. So, I started making some changes and little by little they have become transformative. I got in tune with myself and got to know myself for the purpose of becoming happier, more fulfilled, and free from the nasty things I was telling myself...and believing to be the truth. This work has not been anything I learned in school or in a book. It has come from experience--the practicing, the dedicating, and the perseverance. -Practicing being kind to myself and showing grace. -Dedicating myself to continue growing. -Persevering when things didn’t work out and I could just quit and go back to my old ways. Through all of this I have discovered many pieces to the puzzle that are so simple, yet effective. And while on this path I have met so many who have their pieces to share too. We are going to bring it all to you, and grow the tribe of hairdressers who feel like they are connected and empowered. Are you ready to join us in creating an industry that is unstoppable? It’s our time. This is for us. Listen —> To the podcast…you won’t regret it! Subscribe—> Subscribe to our e-mail list and stay up to date on the haps. Darkness is a place no one wants to be in. It can feel like a deep hole with no escape ladder, a cave with no exit sign, a house with no doors or windows---A trap. I have allowed myself to feel like this so many times in my life. The good news is I have discovered many things down in the depths of there and I want to share them with you. If there is one thing I have learned in my almost 31 years of life it’s that we’re all a hell of a lot more alike than we are different. We are all here for the same purpose, just different paths. This is mine. I am a hairstylist by trade. It is my passion, my creative outlet, and my natural gift. It has never been hard for me to look at a head of hair and create a plan to make it prettier and more flattering. It is easy and fun. What has been hard for me is acceptance. Acceptance of who I am and who I am meant to be. Which I have now discovered is the opposite of darkness, it is purely and simply; light and love--A vessel delivering goodness. The funny thing with acceptance is that no one can make us realize it, it has to come from within. Wouldn't that be nice if there was some sort of "A-HA" slapper that could just punch you in the face and suddenly you know "how to just be"? --Oh wait, there is...it's called life! It will slap you, kick you, punch you in the face lots of times until you get it. At the end of the day it is our responsibility to develop this awareness and actually do something about it. We cannot gain acceptance from the approval of others. Sometimes that road to discovery is long, winding and full of pot holes and slaps in the face from life. It’s how you navigate them that will make you triumphant or stuck. Navigating these life assaults has not been easy for me because I have always been a pleaser. I would try to make everyone else happy before myself. If my guest’s at the salon, kids, parents, friends, students, literally anyone in my circle wasn’t happy with something I was doing...I would lose sleep, become stressed, have anxiety, even fall into depression. Suddenly everything in my world would seem to be against me. Enter in the shame, blame, and poor me game--life likes to lay it on thick with these ones to really make you wake up. This is where the escape ladder disappears and the hole seems to get deeper. I would blame myself for everyone else’s stuff, when in fact I have no business doing that. It does no good meddling in other people’s “stuff”...(I will refer that often, meaning their own issues, insecurities, fears, and basically life drama) All it does is creates more unnecessary drama in your own life. And that's no bueno. When you dwell in the other's "stuff" you can not create, you can not progress, you can not feel fulfilled. Let it go, let it be...it's not yours to deal with. So what can you do to avoid being in the dark hole of blah? Simple. Focus on you and start creating the life that will make you feel good and whole-YOUR DREAM LIFE. Become in charge of your life instead of feeling like it’s being dictated to you...it’s not! Stop believing that whatever your situation is that you are destined for that forever. You have total power to alter your course. Instead of focusing on what everyone else is doing, feeling, saying, being like...what are you feeling, saying, doing...being like? Are you doing the things you wish to see in other people? Are you saying things that you wish other people would say to you? As soon as I stopped worrying about whatever other people would think of me, I wrote this blog. So here we are on this path to acceptance together. To share what you know is to grow.